All images on this site are for illustration only. Sentinel Spectrum is an oral preventive treatment that works against heartworms, adult hookworms, adult roundworms, tapeworms, whipworms, and prevents development of flea eggs. It is a monthly treatment which is recommended for dogs and puppies over 4 weeks of age. It is also safe to be given to pregnant and nursing dogs. This treatment needs to be given with meal for maximum effectiveness. Before purchasing the product, weigh your dog. Administer Sentinel Spectrum on a monthly basis on the same day of each month on a yearly basis. Give this tablet orally directly in the mouth of the dog or mix it in the dog food. If you mix it in the dog food, ensure that the dog completes the entire meal for the entire dose to remain effective. Children and other pets should be kept away from the product. Safe to be given to pregnant and lactating dogs. Manufactured by Novartis, Sentinel Spectrum is used to prevent, control and treat different types of worm infections. It prevents and controls flea population, prevents heartworm disease and treats and controls roundworms, hookworms and roundworms in dogs. 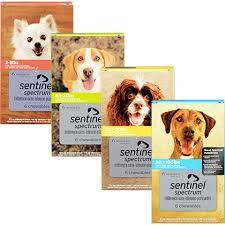 Milbemycin Oxime, Lufenuron and Praziquantel are the three active ingredients present in Sentinel Spectrum. Milbemycin Oxime interferes with the nervous system of the worms thereby getting rid of immature stages of heartworm larvae and adult stages of hookworms, roundworms and whipworms. Lufenuron is an insect development regulator that breaks the flea life cycle by stopping the flea egg development. But it does not kill adult fleas. While praziquantel causes muscle spasms in tapeworms resulting in their elimination from the body of the dog through natural mechanisms. Thus, the combination of all these three ingredients results in protection of the dog from heartworms and prevention of gastrointestinal worms including hookworms, tapeworms, roundworms and whipworms.